In this post I am going to discuss about one easy way for earning money from online. Normally, I won't give much importance for reading articles about earning money from online. Because, most of them will be fake or at least they will be requiring some investment. So, I hesitated to write this post about earning money from online as I didn't want this article to be viewed as one among them. For the past one month, I was thinking about whether I need to write this article or not. Finally, I decided to write this post as it may really help few people who are really interested to earn money online by willing to do lot of hard work in genuine way. And I have one more reason to write this article. As I am planning to write this post with lot of useful information and my experience, I believe many people will share it with their friends. So, it will bring more visitors to my blog which will again help me to earn more money. It is a win-win approach. Before giving more details, I want to clarify few things. As I am going to write mainly about earning money from youtube videos, I would like to clarify that I am NOT working for YouTube or Google. So, don't take it as official. I am going to write it based on my personal experiences. I haven't done any research/survey/study to come up with this article. I am just writing it based on my own experience and my own thoughts. So, it need not be applicable for everyone. Let me first give some details about me so that you can understand this article better. I have completed my Engineering Degree in 1998 in India and worked for various IT companies including IT wings of big investment banks such as BNY and CitiGroup in various roles (mostly in test automation) till 2008. You can see my linkedin profile for more details. Timesheet Software. This business model is somewhat better than the previous one, because the high employee attrition rate didn't affect this model much. But this model is also not giving much profit as the advertising cost is high. I have tried various others ways, such as earning money from taking online QTP course, selling QTP ebook and affiliate marketing. But they are not much effective. In the mean time, I have noticed that the Google adsense is giving significant earnings from this blog which I started to share my software development experiences initially. So, I had decided to choose Google Adsense earnings as the primary source of income. So, started many websites for showing adsense ads. Even I sold many websites through Websites-market-places such as Flippa and Digitalpoint Forum by showing the adsense revenue. So, I realized that Google Adsense is the best and easy way for earning online. But the websites flipping approach didn't help much as I faced difficulty in selling many sites. Sometimes the Fees for selling the website is more than the website sales price. And, the instability in our Team causes high development and promotion costs. Unnecessarily I was spending money for renewing many domains, and for the hosting servers. So, finally I decided to drop lot of websites by letting them expire themselves instead of wasting my time and money for trying to sell them through Flippa. Unstable Team causes lot of issues. For example, I have done lot of harwork to bring Automatic Resume Posting tool which has lot of potential to earn money easily. But because of the instability in our Team, I couldn't make money from that amazing thing. And therefore, I reduced our Team size by closing our Chennai office to avoid further losses driven by unstable team. Right now I have office only in Ottapidaram with very small team. I agree that taking steps to create better and stable Team is the proper way instead of just reducing the team size. But I strongly believe in the message conveyed in the article "The 4 Things Every Entrepreneur should Follow"
So, I prefer to rebuild the effective and stable team from the scratch instead of trying to correct the existing Team. And, that's what I am doing now. Ok, Let me explain why I am telling all these things while the purpose of this article is about earning money from YouTube Videos. I just want you make sure that you should understand that difficulties are there everywhere, so difficulties you may face while trying to earn money from your YouTube Videos should not stop you from doing it. Everyone should understand it very clearly. That's much more important than all other things. That's why I am trying explain it by spending more time. Ok, now let me continue it. From my above detailed explanations, it is clear that unstable Team won't allow the Entrepreneur to earn money from any kind of initiative even if all the other things are supporting the Entrepreneur. So, I have only two ways to make the Team stable. i-e Either I have to find passionate Team members who will work hard without worrying much about their current salary, or I need to give the salary on par with corporates. I don't have much control to follow the first way as it purely depends on the candidates. In India, it is very difficult to find passionate Team members who cares much about future benefits than the current salary. So, I have to choose the second way, i-e I need to give salary equivalent to the corporates. Again I have two ways to do it. Either I have to allow external investors or I need to find other ways to earn money before hiring anyone else. I don't prefer the external investor as it will limit the freedom for our strategies and activities. So, I have decided to find some way for earning money without depending on Team members much. i-e I was looking for some kind of passive income. That's where YouTube is coming. I have tried various ways for earning passive income. But I feel YouTube is the best among all the tried ways. I had spent lot of time, money and energy for trying all other things. But they haven't given any significant benefits. Surprisingly, I started earning significant money from my youtube videos without spending any money for doing it. In October 2012, I had done some analysis about future trends, and found that YouTube is the one among the 3 important online business. So, I decided to focus more on YouTube. Till now I have explained about the reasons for choosing YouTube for earning money. Now let us see how to actually earn money from YouTube. After creating YouTube Channel and associating it with Adsense account, we can start earn money for our youTube videos that are qualified for monetization. So, we have to just focus on creating youtube videos and promoting them to get more views and subscribers. Once you earn $100 , Google will send you the money as cheque or directly deposit in your bank depending on your country. Starting YouTube Channel and getting Adsense Account is not a big deal. You can do it within few minutes. And, you can get any kind of support from Google if you find any difficulty in creating channel or any difficulty in receiving adsense payments. So, the only thing we need to focus is, getting views or visitors to our videos. i-e promoting our Videos. Getting views to our videos is not an easy task. It will be really challenging one. Many people will drop their plan of earning money from YouTube once after facing this challenge. That's why I had explained the difficulties in all other kind of online earning ways. So, difficulties and challenges are there everywhere. But YouTube is having lot of options to handle the challenges easily. So, comparatively I feel YouTube is the much better way for earning money easily, and that too without spending any money. So, if you drop your plan of earning money from youtube after facing the difficulties in getting video views, I can say that you are NOT going to earn money from any other online earning opportunities. As I explained in my previous post, I had spent lot of time in improving loading performance of our website TheQuotes.Net. But we need not worry about these performance things when using YouTube. Google will take care of all hard things. It will deliver youtube videos in various formats at good speed throughout entire world. The uptime of Youtube site is very high. Google is continuously taking steps to improve the quality and delivery of youtube videos. You may say that youtube is providing limited control comparing with our own websites. I agree with that point and it is true that Youtube is having some shortcomings. But they are not going to harm you in any way. Let me address them one by one. First, youtube will not allow you have your own domain name. i-e everyone should use the domain name youtube.com. So, we can not sell our youtube channel to anyone else. I feel it is actually providing advantage rather than disadvantage. Because, if we have our our domain name, we may sell it at some time for some reason. But based on my understanding focusing on particular thing for long time is the key for the success. So, youtube is giving you that opportunity. And, next thing is, YouTube won't allow you to use any advertisement program other than Google adsense. This one also actually provides advantage, though it looks like a disadvantage. I have tried various ad programs including yahoo's media.net for our TheQuotes.net site. But they perform very poor even though they claim that they are better than Google Adsense. So, ultimately I wasted time and money in trying other ad programs. The other thing is, YouTube will take 45% of the adsense earnings. This one also won't affect you much. Because based on my experience, RPM for my youTube Videos is still high even after reducing 45% youtube cut, comparing to the RPM of my other websites. So, I am not seeing any disadvantage in focusing on youtube videos. Now let me give some tips and tricks for using youtube effectively to get more views and therefore earn more money. Choose your channel name appropriately. I have selected the name qualitypointtech to match with our company name. Anyway, I have integrated with my Google+ profile. So, you will be seeing my name "Rajamanickam Antonimuthu" when seeing my videos. Based on my understanding many people will come to our youtube channel by searching it from Google. So, our youtube channel will be shown to the people who search "qualitypointtech" or "rajamanickam" from Google. So, choose your channel name in unique way so that people can reach your channel by searching it from Google. If you choose some fancy name which is very common, your channel may NOT be shown to the users when they search it from Google. i-e Branding is very important to get traffic from repeated visitors. If you are not doing it properly you may lose them even if they are interested to view your channel. Getting more subscribers to our channel is very important in terms of getting more views as well as getting good search rank, even for getting some new youtube features (e.g paid channel) which are not available for channels with less number of subscribers. So, take more care to get more subscribers. Ask everywhere to subscribe for your channel by giving subscription link to the viewers. For example, you can add your channel subscription link in description section of all videos. You may find our channel subscription link http://www.youtube.com/subscription_center?add_user=qualitypointtech at description section of my videos. You can replace "qualitypointtech" with your channel name. And, you can add subscription link through "annotation" feature of the video. You can find "subscribe" link imposed on the video at the end of many of my videos. We can easily add it by choosing "subscribe" option from drop-down list when setting annotation for your video. You need to type your channel name after choosing "Subscribe" option when adding annotation. And, if you have your own website or email list you can add your channel subscription link there also. Even you can add your youtube channel subscription link as part of your email signature. We can embed the youtube channel subscription widget in our blog posts and side bar of the blog or our websites. For example, find below the subscription widget for my youtube channel. I had added below code to make it visible. You can replace "qualitypointtech" with your channel name to create subscription widget for your youtube channel. Youtube allows you to have channel subscription video. So, make sure that you create one such video and add it as channel trailer so that any new user visits your channel see the channel subscription trailer video. You may see this video when visiting my youtube channel first time. If you have already subscribed to my channel, you won't see this video. YouTube is the most used search engine next to Google. So, getting search traffic from YouTube is very important to get more views to our videos. So, make sure that you add your target keywords in Title, description and tags of your Video when uploading it. And, note that you have to keep your keyword at beginning of the title. Read this YouTube playbook article to read more details about them. I have noticed that videos are getting some boost in search rank if we make them as HD video and add subtitle/CC to them. Read my previous post to know how to create HD Video using windows movie maker. I think thumbnail of the video plays important role in getting more views. So,Create and upload an eye-catching, high-resolution thumbnail. this post few years back, Google gives some priority to youtube videos over other websites. i-e Your news item will be treated equivalent to other big news sites. Once after uploading our videos, we have to promote it in social media sites such as Twitter, Facebook and reddit. We can connect our youtube account with twitter and Google+ so that video can be automatically posted to twitter and Google+ once after completing the upload. And, You can find list of social media sites here for promoting your videos. Apart from sharing your video in your own wall in Facebook, try to share it in relevant facebook Groups and Facebook pages. After uploading the videos, remember to add them into relevant playlist to organize them properly. And, show your best playlists in your channel home page. Marking your playlist as "Series playlist" will help you to get some more views to your videos. But do it only if the videos in the playlist are relevant or related. Watch your YouTube analytics report regularly to get details about what kind of videos are earning more. Based on this analysis you can plan your further video creation and promotion activities effectively to maximize the earnings. YouTube provides many online tools to create videos. For example, you can use the music from youtube audio library. Be careful about whether the audio library song allows you to monetize your video. Some tracks will show their own ads, you won't get paid for that. So, use it only when it is really required. Always try to give informative video with reliable details, and with proper credits. If your videos goes viral, you can earn money very quickly. You can see some viral videos here. But it is very difficult to judge which video will go viral. So, instead of spending time in making viral videos, better we can focus on creating videos which is helping others by sharing knowledge and experience gained by us in long term. And, whenever you share your video, better share them from playlist. It will give two benefits. One is, your channel will get more views as people tend to view similar videos in the playlist, and next benefit is, probability for the users viewing the ads will be increased, and therefore you can earn more money. For example, I used to share the link like this one for sharing our "Alphabet of Happiness" video. So, mostly people will watch more videos in the "For Happiness" playlist. I worked for corporates few years back. So, still I have to explore various ways to improve as an Entrepreneur. And I strongly believe in below Quotes, and therefore I am going to continue my hard work to develop our YouTube channel further even though the current revenue from our youtube channel is not high. Based on my all previous experiences, I can predict that my youtube channel earnings will increase very soon. It is great that you have read this post till the end. It shows that you are passionate about earning money from Youtube videos. So, start uploading youtube videos immediately while keeping your enthusiasm. Don't worry much about video views or earnings initially. Just focus on creating high quality and informative videos frequently, and promote them at relevant websites and groups. Earnings will follow you at appropriate time. 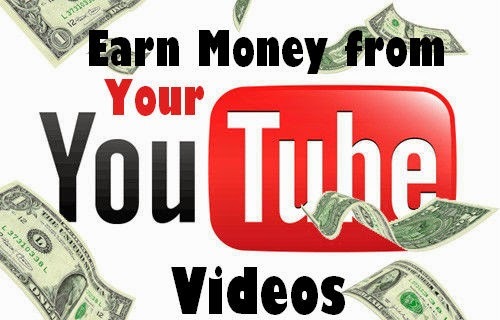 Do you have any other suggestions to earn money from youtube? Share them through the comments. I will update with more details if get enough time to do it. So, you may check this post later to see some more details.